The oil cleansing method was my DIY experiment until this morning. 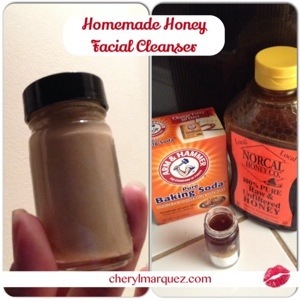 I was browsing Pinterest and this honey facial cleanser caught my attention. Honey has great healing properties and it’s moisturizing. It’s especially useful during the winter when the heater dehydrates your skin. I needed a container for this new cleanser so I dumped out an almond scrub sample from either Sephora or Ulta. Then cleaned out the container, dried it and added baking soda halfway up the container. Next, I heated raw organic honey for about 30 seconds in the microwave, except the honey container melted…grrrr!! Thankfully, I had a brand new container of raw unfiltered honey which was in a pourable state so I squeezed out enough to fill the container with room to mix the honey and baking soda together. Add the baking soda and honey to a clean glass container and mix it all together. This should be enough cleanser to last about a week. Scoop some of the honey mixture into your hands, spread it over your face before jumping into the shower. Do your shower routine, then lightly rub the honey mixture into your skin, focusing on areas you normally get blackheads, then rinse off. The steam from the shower will let the honey sink into your skin to help moisturize and heal. Then the baking soda will help decongest your pores as your rub it into problem areas. What’s your favorite winter skincare routine?